Published: Jun 28, 2016 · Modified: Apr 12, 2019 · By Jen Sobjack · This post may contain affiliate links. 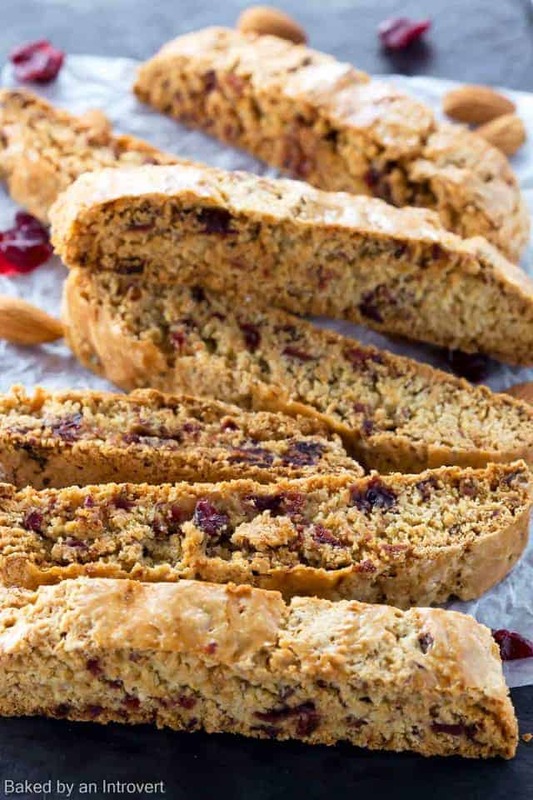 This simple recipe for homemade Cherry Almond Biscotti is like a little piece of heaven. If you’ve never made biscotti at home, you are in for a real treat. This recipe yields crisp, tender cookies that won’t break your teeth. When it comes to biscotti, it’s hard to beat a crunchy texture that isn’t difficult to eat. All too often they are extra hard and nearly break your teeth if you try to eat it without dunking it in coffee or milk. This recipe for Cherry Almond biscotti is just the opposite of that! Classic biscotti is a well-known coffee house cookie. Their crunchy texture makes them perfect for dipping. They are sweetly flavored and often times speckled with nuts or dried fruit. The variations between recipes produce different levels of sweetness and crunch. But for me, there are certain elements that make the best biscotti. The biscotti that I enjoy most are crisp but still tender enough to eat without dunking. They are studded with my favorite dried fruit, cherries in this case. Each bite offers a sweet almond flavor that you simply can’t get enough of. The almond scent that fills the air as the biscotti bakes is almost as good as the taste. To keep the biscotti from being too hard, I swap a small portion of the all-purpose flour for almond meal. This helps to minimize gluten development in the crumb, keeping it loose and crumbly. 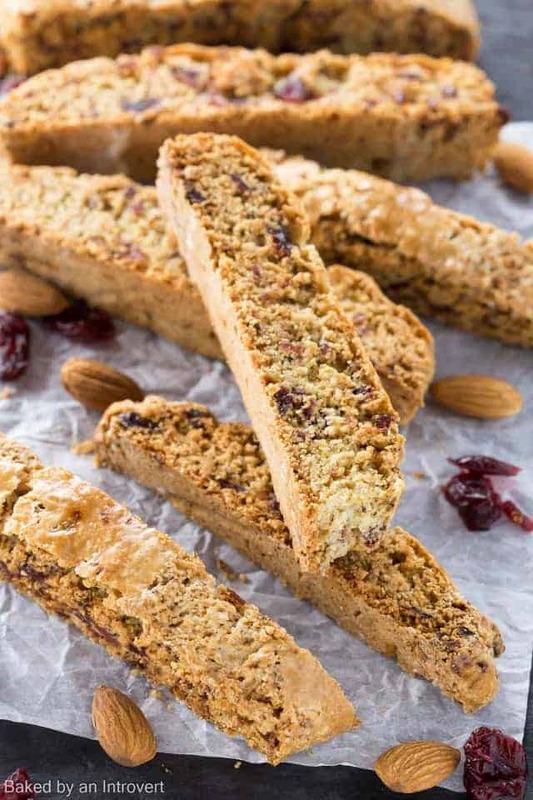 Using a combination of oil and butter give the biscotti intense buttery flavor and softens the crumb. This is a recipe that you can enjoy without dunking in coffee or milk. Biscotti always get baked twice. First, shape it into a log and bake it until set. Then, cut it into slices and bake on each side until crisp. The oil and butter work their magic in keeping the biscotti from drying out during its second round in the oven. No dry, tooth-cracking biscotti here! Preheat the oven to 375°F. Line a large baking sheet with parchment paper. Set aside. In a medium bowl, cream together the oil, butter, and sugar. Beat in the almond and vanilla extracts, followed by the eggs. In a separate bowl, combine the flour, almond meal, salt, and baking powder. Slowly add the flour mixture to the egg mixture. Mix just until dough forms. Stir in the cherries. Shape the dough into two 12×2-inch logs on the prepared baking sheet. Press down to about 1/2 inch thick. Bake for 25-30 minutes or until lightly golden brown. Allow the logs to cool enough to touch. Slice into 1/2-inch diagonal slices. Lay each slice cut side down. Return to the oven for 10 minutes longer or until lightly toasted on each side. Cool completely on a wire rack. Biscotti will keep for up to 2 weeks stored in an airtight container stored at room temperature. Recipe adapted from my Orange Cranberry Biscotti. Hello from a Canadian Foodie! We loved these. Thank you, Jen. I made them more-or-less as your recipe stated. Used part organic sunflower oil, but I think the cookie is strong enough to handle only EVOO, too. Plus the butter, of course. Mine is lightly salted butter by nature (Stirling butter). I only used 1 tsp of the almond extract. And reduced to b powder to 2 tsp b/c I don’t like things too puffy. And a sl. heaping 1/2 tsp of kosher salt. Along with the dried cherries (yum), I added toasted slivered almonds. I added a bit more than a cup of the cherries. The next time (there will be many next times), I will use regular almonds, chopped. The slivered ones always seem as if the flavour has been leached out of them. BTW – it was a great idea to use the almond meal. Finally, I’m never able to cut my biscotti as thinly as suggested, and instead, cut them to be about 3/4 inch. That was fine, too. In any case, they were fabulous. And I enjoyed your delightful intro’, too, Jen. p.s. I have a nice recipe for some biscotti with EVOO, dried apricots and cocoa nibs. Plus another one calling for walnuts and rum. If you ever might like to see these, happy to share! Thanks for the comment, Helen! We love this biscotti as well so I’m thrilled to hear you enjoyed it too. I love homemade biscotti! I wish I had a piece to go with my coffee right now! 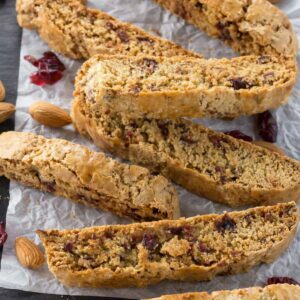 I love homemade biscotti, they are so easy and good! loving the flavors in this one! I’ve never made biscotti, but can’t wait to try these! Love the combination! Love that there is almond meal in the dough, too! Pinned! I can never turn down homemade biscotti! Especially when they look this delicious and dunkable! Love the cherry and almond combo! The almond meal is such a tasty addition! Thank you! We gobbled them all up! Oh my! 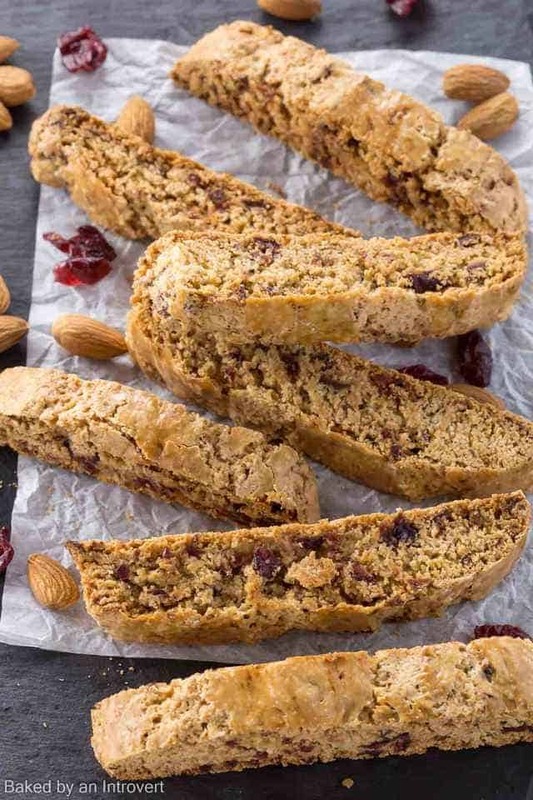 I’ve made biscotti many times but have never switched out flour for almond meal…I love that idea and can’t wait to try it! Your pictures have me very hungry and in the mood for coffee and biscotti right now! The almond meal really helps keep the biscotti from being too tough. I love it! This biscotti looks delicious, Jen! I love cherry and almond together and the almond meal was such a good idea in these! There is nothing like homemade biscotti. I love the texture so much more than store-bought ones. I’ve made plain almond and chocolate chip before, but never almond and cherry. They look great! I’ve never made biscotti before, but I love getting this treat at coffee shops. Sounds delicious with the cherries and almonds, Jen! Just what my morning coffee needs! I prefer to make it myself so I can control how crisp it get gets. I don’t like them to be too hard on the teeth.